STC Craft/A Melanie Falick Book, 9781617691744, 160pp. When Lotta Jansdotter steps out in one of her signature outfits, fans always ask, “Did you make that yourself?” Often the answer is, “Yes, and so can you!” With that in mind, the style icon created Lotta Jansdotter Everyday Style, a pattern book/inspiration guide anchored by five easy, versatile sewing patterns—skirt, dress, blouse, pants/shorts, and jacket/coat—and highlighted with quick DIY accessories, including hats, bags, scarves, and jewelry. Photographed over the course of a year in her life in New York, Tennessee, India, and Sweden and organized by season, Jansdotter shares her sources of inspiration and how she and her friends mix and match her key pieces while working, play- ing, resting, and traveling. Lotta Jansdotter Everyday Style brings Jansdotter’s infectious and sought-after sense of style to new followers and longtime devotees alike. Lotta Jansdotter is a New York-based Scandinavian designer. Her creations, ranging from stationery to dishware to textiles, are sold worldwide and have been featured in publications such as O, Martha Stewart Living, and Sweet Paul and at retail stores such as Anthropologie, West Elm, and ABC Carpet. 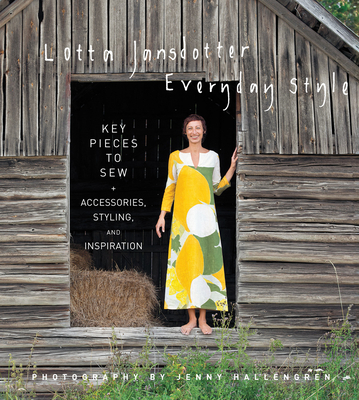 She is the author of six books, including Lotta Jansdotter’s Everyday Style.